For the last three nights of my trip I chose Malaga as my destination. I had a direct connection to Bucharest, the city has a beach, I wanted to see Picasso’s birthplace and just relax after walking so much. The bus from Nerja left me at about 200-300 meters from the hotel so I wasted no time in getting to the hotel and going out immediately to start exploring Malaga. 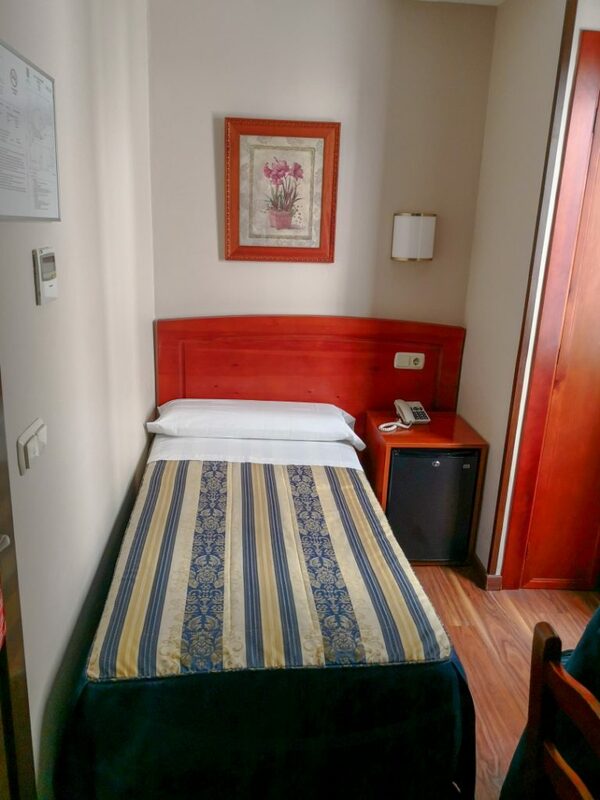 Hotel Castilla Guerrero, a 3 star hotel, is situated on Calle Cordoba 7 and outside you have a taxi station which you can use to reach the airport like I did. 21 eur was the cost and it was worth it since I was tired after 2 weeks of walking and exploring and one final day in which even though I said I will rest I ended up walking for another 18-20 kilometers. Before booking the hotel I looked for its surroundings and found the hotel to be close to many things I wanted to visit. Of course the big score on booking.com helped and the fact that the hotel has over 2000 reviews. The Picasso Museum is about 800 meters away, the Cathedral is about 550 meters away, Alcazaba is about 900 meters away while the Castillo Gibralfaro is 1.9 kilometers away. If you want to relax and unwind at the beach the famous Playa la Malagueta is 1.1 kilometers away while the ferry terminal is about 600 meters away. So you can clearly see that visiting on foot is possible, the distances being small. Even before starting the review I will tell you that on the ground floor next to the hotel is a small cafeteria where you can serve breakfast if you want. I chose to eat something light on the morning of my flight due to the fact that I never eat big before flying and I wanted to walk some more, admire the city, take it easy(even though I didn’t) and not wait for 12:00 o’clock to have restaurants open. Regarding the hotel I can say that the staff is OK. I have not interacted with them so much but that’s because I was at the end of my trip. All the tickets, train, bus, entrances fees were gone so I did not require their help so much. Level of English was good and I was satisfied in dealing with them. The room was little. I think only at Nochela Sevilla did I have a smaller room. But it was very clean, room service was present each day, the sheets, covers were clean so I was happy with it. The bed as usual was small, one person size but a bit larger than the one at Hotel Universal. 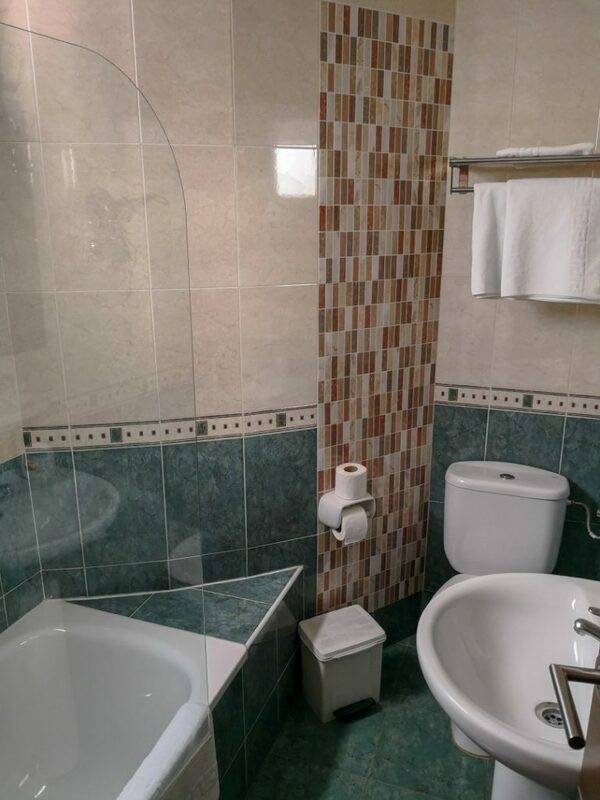 The bathroom was spotless and made each day, new supplies being brought to the room (soap, towels, etc) and it was decent in size. As an extra bonus this room was heated also so at the end of the trip I can say that it was 50-50 with Seville, Cordoba and Ronda having cold rooms while Granada, Nerja and Malaga brought heated rooms. All things considered I enjoyed my stay at this hotel and I wouldn’t skip it if ever in Malaga another time. I think that I agree with the rating on booking.com and I, myself would place this hotel at 3 out of 5 stars. Even though I wrote quite a few articles for this series we are not over yet. I plan to write another article about a place I really enjoyed eating in Malaga, an article containing information about the itinerary, prices, sights and fees(as much as I can remember) from my trip and here I will talk about my experience in Andalusia as a whole and an article for eating in Nerja.